Logue Industries is a job shop that provides welding & fabrication services to all industries. Our material inventory spans plate, bar, tube, channel, beam and pipe. We also inventory multiple AR and stainless plate types and a number of standard and flattened expanded metal varieties. Shape Cutting We can receive .dxf files directly into our cutting software. We also have a CalComp 4ft x 5ft digitizer to transfer your custom template shapes to our cutting systems. 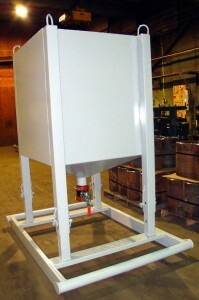 This eliminates you from having to go through the time consuming manual dimensioning process! Logue Industries offers:cone-tanks-4x4x4-23Torchs_L CNC waterjet cutting CNC oxy-fuel cutting CNC plasma cutting capabilities We can repair, replicate or build new depending on your application. We also provide sheared, saw cut and formed metal parts. Steel deliveries from multiple vendors are made daily. Shape Cutting MultiCam CNC Water-Jet – 10′ x 20′ table MG Industries CNC Oxy-fuel & Plasma – 10′ x 20′ table Saw Cutting Marvel Vertical Cut Off Saw – 18″ x 18″ Rect DoAll Cut Off Saws (2) – 10″ Dia. or 9″ x 12″ Rect. Shearing Cincinnati – 1/2″ C.S. x 12′ Pexto – 10ga C.S. x 3′ Press Brakes Cincinnati CNC – 230 ton x 14′ Bed Chicago – 55 ton x 96″ Bed Rolls Roundo Plate Rolls (12″ Min Inside Dia.) max 9/16″ C.S. x 96″ wide max 1″ C.S. x 28″ wideÂ Wysong Plate Rolls (5″ Min Inside Dia.) max 1/4″ C.S. x 60″ wideÂ SMT-Pullmax Z41 Angle Rolls Angle Max – Leg Out – 5″ x 5″ x 1/2″ from 63″ Dia. Angle Max – Leg In – 4″ x 4″ x 1/2″ from 72″ Dia. Flat Bar Max – On Edge – 5″ x 3/4″ from 50″ Dia. Flat Bar Max – Flat – 8″ x 1.5″ from 32″ Dia. | Logue Industries, Inc.
Logue Industries is a job shop that provides welding & fabrication services to all industries. Our material inventory spans plate, bar, tube, channel, beam and pipe. We also inventory multiple AR and stainless plate types and a number of standard and flattened expanded metal varieties. We can receive .dxf files directly into our cutting software. We also have a CalComp 4ft x 5ft digitizer to transfer your custom template shapes to our cutting systems. This eliminates you from having to go through the time consuming manual dimensioning process! 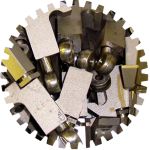 We also provide sheared, saw cut and formed metal parts. Steel deliveries from multiple vendors are made daily. DoAll Cut Off Saws (2) – 10″ Dia. or 9″ x 12″ Rect. Angle Max – Leg Out – 5″ x 5″ x 1/2″ from 63″ Dia. Angle Max – Leg In – 4″ x 4″ x 1/2″ from 72″ Dia. Flat Bar Max – On Edge – 5″ x 3/4″ from 50″ Dia. Flat Bar Max – Flat – 8″ x 1.5″ from 32″ Dia.